"Most people have made their mind up and a clear majority are not even considering the reality TV star. The race was already Clinton's to lose and she did a good job last night in defending that position." Fighting against a backdrop of terrible polls, Donald Trump desperately needed a gamechanging, momentum-reversing performance in last night's third and final debate. There were other positive indicators from the snap verdicts. CNN's debate-viewer poll - which they acknowledge is slightly skewed towards the Democrats - showed a closer margin than last time at 52-39 to Clinton. On issues and authenticity, he earned a virtual tie. However other key measurements indicated that Trump's efforts were in vain. Asked whether the debate made them likelier to vote for either candidate, 23% said Trump, 22% Clinton and 55% no change. A huge 61-31 majority considered her to have better understanding of the issues. On being prepared for the presidency, Clinton dominated yet again, 59-35. Therein lies Trump's fundamental problems - he has never been regarded as qualified or temperamentally fit for office. I wrote before the first debate that he had a brief window to reset that image and improve longstanding unfavorables. Instead he reinforced it, doubled and tripled down afterwards - dealing fatal blows even before the groping tape and sexual assault allegations destroyed his credibility and candidacy. Most people have made their mind up and a clear majority are not even considering the reality TV star. The race was already Clinton's to lose and she did a good job last night in defending that position. Moderator Chris Wallace was widely acknowledged to have played a blinder, keeping these two mortal enemies in check, and the Fox News anchor asked the questions Clinton's enemies have been begging for. How could she explain the comment about her dream of 'open borders' made to bankers, as revealed by Wikileaks? What about 'pay for play' allegations regarding her tenure at the State Department the Clinton Foundation? It wasn't her finest hour and Trump had plenty more promising lines of attack - on failed foreign policies, linked cleverly to trade deals and his charge that Clinton and Obama are being outsmarted by America's enemies. However this game is all about the headlines that will dominate the subsequent news cycle. And while Clinton's troubles could have made headlines were she up against a better opponent, in Trump she faces someone with a knack for publicity and alienating a majority of people. Instead, the key takeaways were terrible for Trump. Most significantly, he refused to commit to accepting the election result - this after running mate Mike Pence and daughter Ivanka had said the opposite. Cue incredulity and instant, almost universal condemnation from across the mainstream political spectrum. 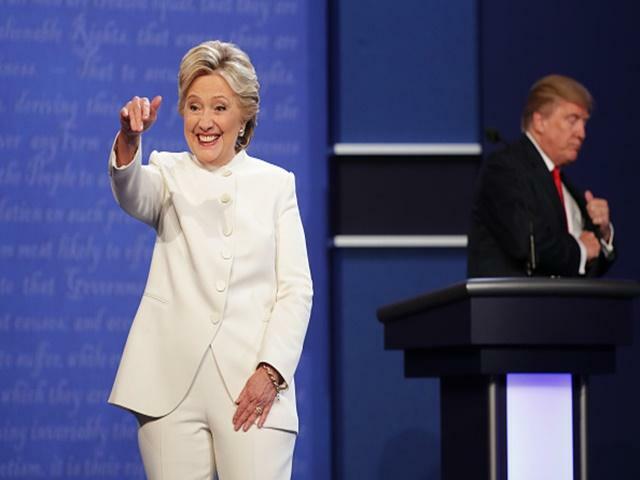 Clinton's response was a winner, too, citing other times Trump had whined about the system being rigged against him - after primary defeats, court rulings and even when his show didn't win an Emmy! This segment will be repeated on a loop today. Another throwaway, yet damaging, moment came when he interrupted Clinton to call her a 'really nasty woman'. Besides the double-standards from a man who insults her and others on a daily basis, it simply wasn't presidential. There will also be focus on the fact-checkers again, exposing falsehoods on Trump's employment and non-payment of foreign workers, his inconsistency regarding nuclear weapons, Russian hackers and a debunked accusation about Clinton's tenure at the State Department. You can bet the Clinton campaign will be re-iterating the fact that Trump interrupted her 37 times. Betfair's Next President market begun the night with very one-sided odds, with Clinton at [1.22], Trump [5.7]. By the end the bettors were even more confident about her chances, shortening to [1.19] with Trump out to [6.2]. I wrote beforehand that Trump was locked in a negative cycle and recovery now feels unimaginable. Expect more terrible polls in the next few days and even less back-up from mainstream Republicans. Opportunities are appearing all over the map for Clinton and, rather than fighting hard to win the slate of swing states they need, the Trump campaign will be forced to focus on Arizona, Georgia, Texas and even Utah - states where any other Republican would take a landslide for granted. By insisting that the election is rigged against him, Trump has given supporters an excuse to stay home and, likewise, the incentives for sceptical Conservatives to vote against their conscience are fading fast. Unless Trump is right about the polls being systematically biased against him, this race is all but over.